Amazon Parrots are known as the feathered chatterboxes among the Parrot family. Most Amazons are vivid green in color with short wings. They possess the intelligence level as equivalent to a toddler. Amazon Parrots have 27 species. The Amazon Parrots are known for their outstanding vocal abilities, playfulness, and comic antics. They are usually loyal and loving companions. 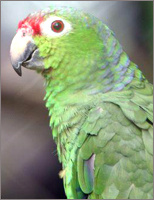 Most Amazon Parrots are predominantly green, with accenting colors that depend on the species and can be quite vivid. 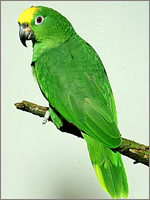 The Amazon Parrots are native to the New World ranging from South America to Mexico and the Caribbean. Amazon Parrots are extremely intelligent and playful birds that love being the center of attention. They are considered good talkers, however, some species of Amazon Parrots talk more than others like double yellow headed, yellow napped and blue fronted. Amazon Parrots can be quite noisy. They can be good screamers, though not as loud as cockatoos or macaws. The Amazon parrots are very energetic, playful and social creatures. Owning an Amazon Parrot is equivalent to owing a dog without wings. The Amazon Parrots require lots of affection and time from their owners, and they are curious athletic. They also love to perform clownish antics and entertain their owners. Sometimes they tend to become moody suddenly. If not trained and handled properly from a young age, they can become fairly aggressive. 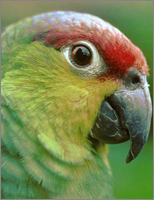 By nature, Amazon Parrots are energetic, playful, social and are endowed with remarkable vocal capacities. Though sometimes moody, these birds are loyal and loving companions. They love interacting with their owners and can be extremely adorable and amusing. However, their temperamental nature sometimes makes them irritable, jealous, stubborn or even loud. To avoid this they should be given required attention as given to other homely pets like cats or dogs. Inexperienced bird owners should not take up training an Amazon Parrot. It is important to be patient with Amazons while training them. When you subscribe to our FREE online seminars and email course and newsletter on Parrot, you will discover the natural instincts of your Parrot and learn about Parrot training, diet and care - FREE! !